Integration combines pioneering InterviewStream platform with expanded video conference experience, allowing up to 25 participants. InterviewStream customers can now host HD video interviews with as many as 25 participants, thanks to a new integration partnership with Zoom, the leading cloud meeting provider. Zoom, which allows up to 25 individuals to collaborate on one session with HD-quality video and audio. Zoom integration also allows for sharing screens and documents, plus recording sessions. Recruiters and hiring managers can easily schedule and manage all of their video interviewing efforts within the InterviewStream platform, with easy access to analytics and the ROI calculator. "Many of our clients asked for an expanded live interviewing tool to accommodate a larger number of key hiring stakeholders," explained Steve Throneberry, InterviewStream's chief revenue officer. "We determined that integration with Zoom was the optimal option to fulfill our clients' needs and provide the best features to suit their unique hiring ecosystems." Zoom can be accessed from any internet-connected device and is fully mobile capable, even with large panels. Zoom also offers a unique "interviewee on-hold" feature that allows interviewers to deliberate. Unlike other InterviewStream tools, Zoom does require a one-time app download by all users and stores video recordings locally on the administrator's hard drive. The option is available at no additional cost to InterviewStream clients and offers an exceptional added value above other video interview providers. "Unlike other competitors who are repackaging the white-labeled version of another platform," Throneberry added, "our partnership with Zoom is a true integration of both our native tools to provide our clients with the largest variety of interviewing options." Current InterviewStream clients may contact their Video Technology Consultant for more information and to "turn on" Zoom for their platform. All new clients can choose during setup to use Zoom or the existing InterviewStream live panel tool. 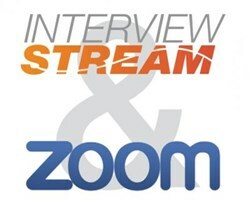 For more information about InterviewStream's integration with Zoom, click here. InterviewStream helps companies generate great candidate experiences and remarkable returns through Web-based video screening, interviewing and preparation. InterviewStream pioneered the category in 2003, and today more than 5 million users have access to InterviewStream products to transform the most-demanding hiring environments and perfect the practice of video interviewing. InterviewStream is part of a growing suite of video apps that go beyond hiring and include: RolePlayPRO for training and performance management, and ivMessage for one-way messaging.